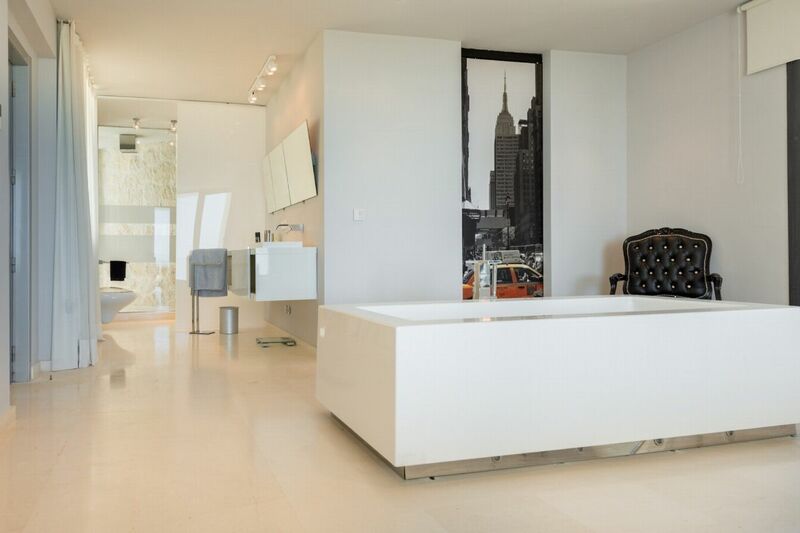 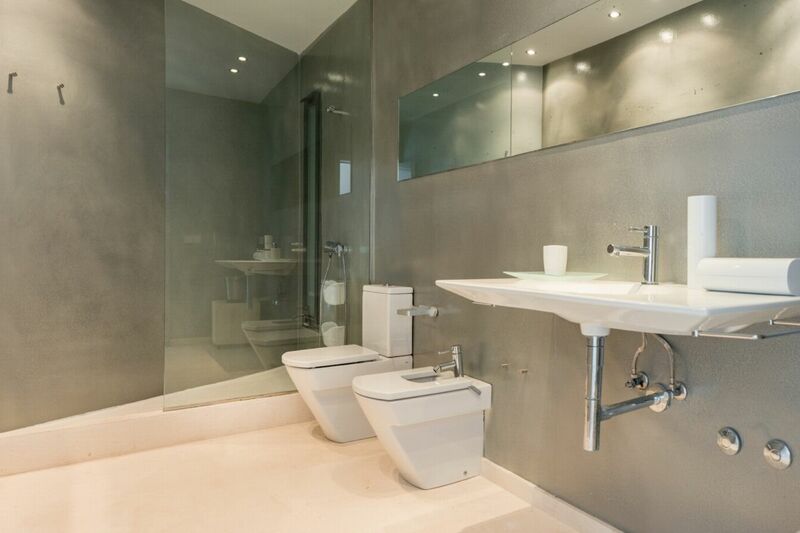 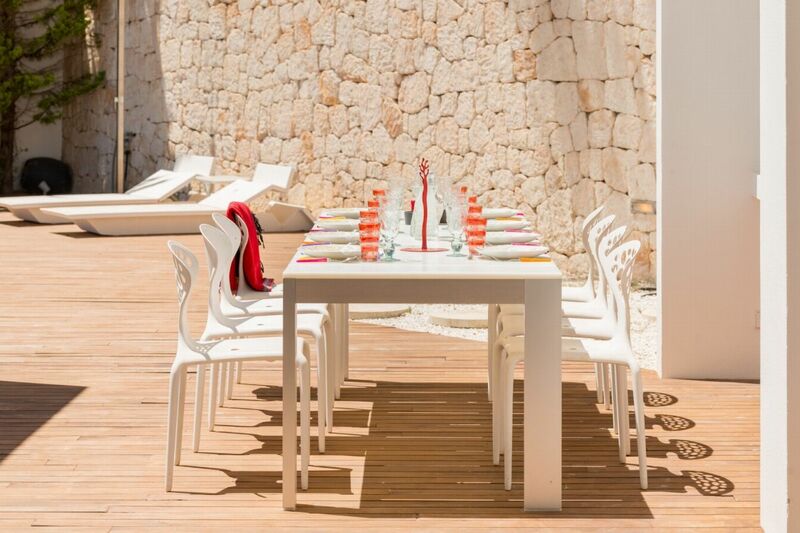 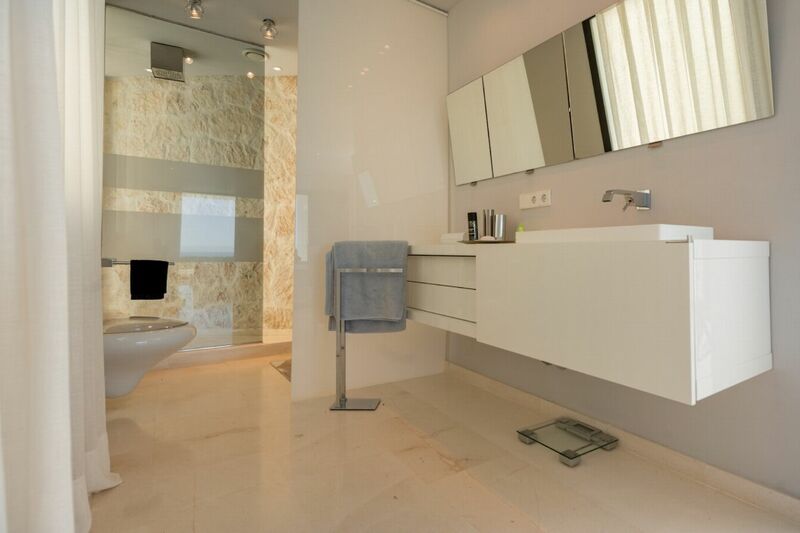 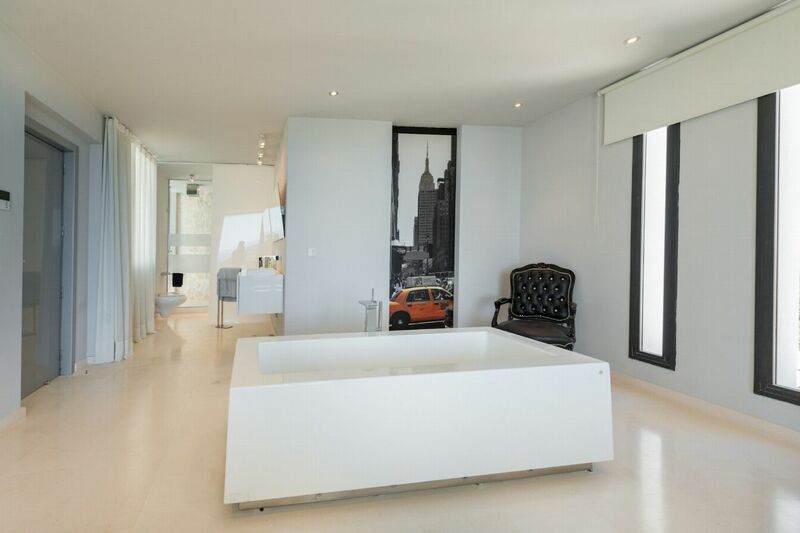 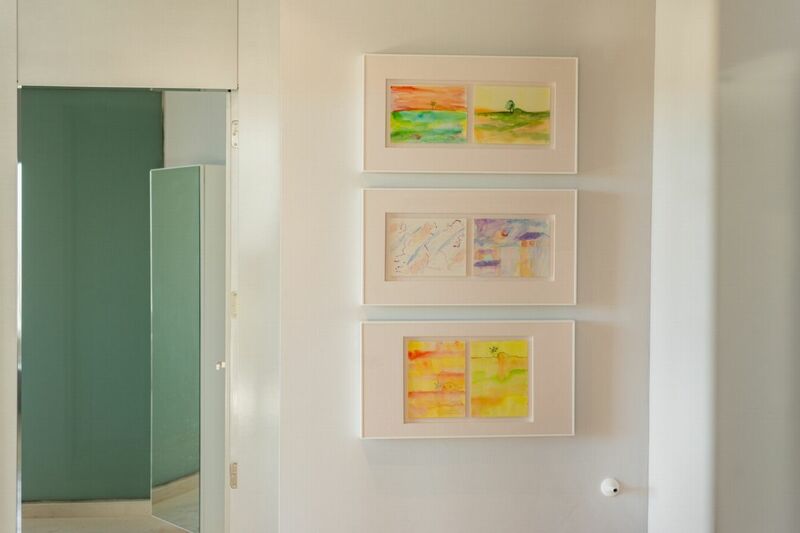 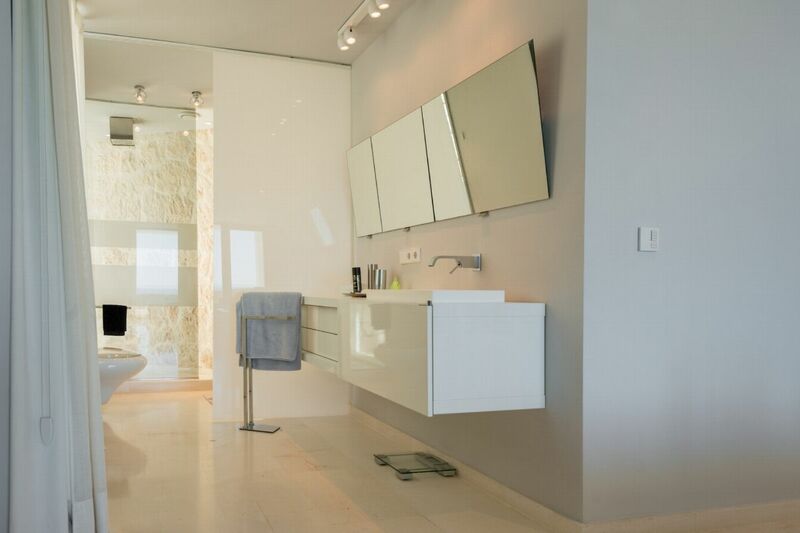 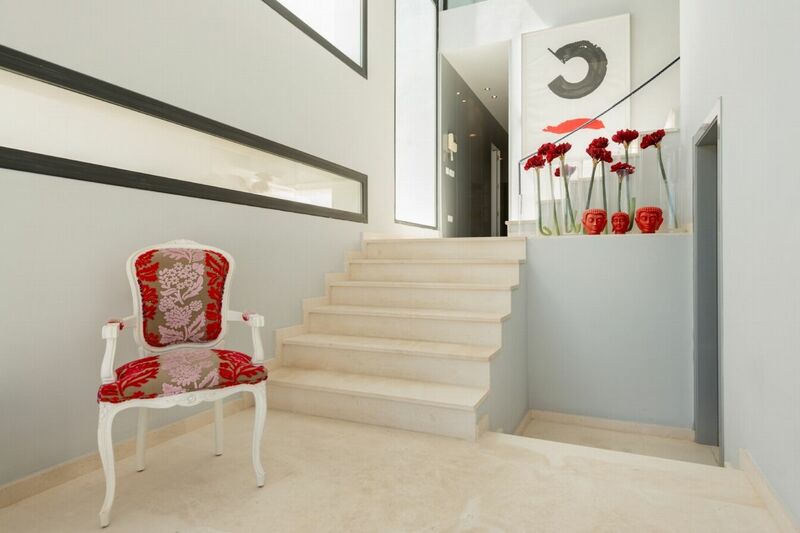 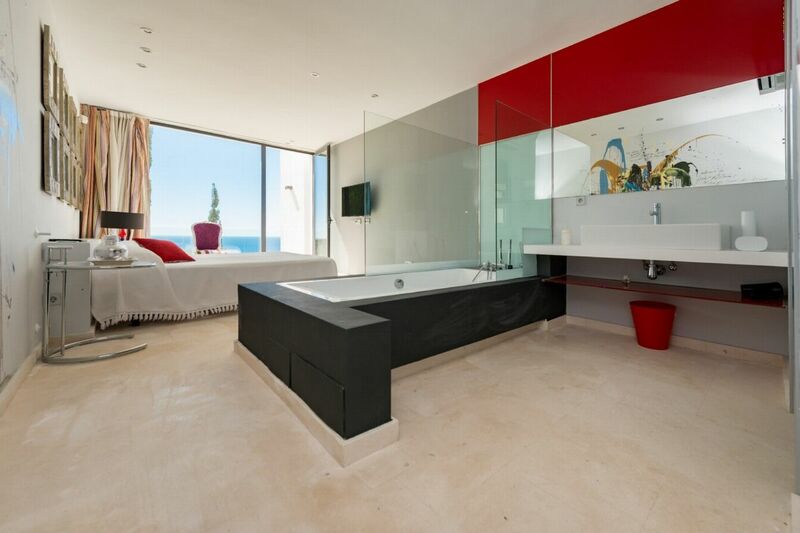 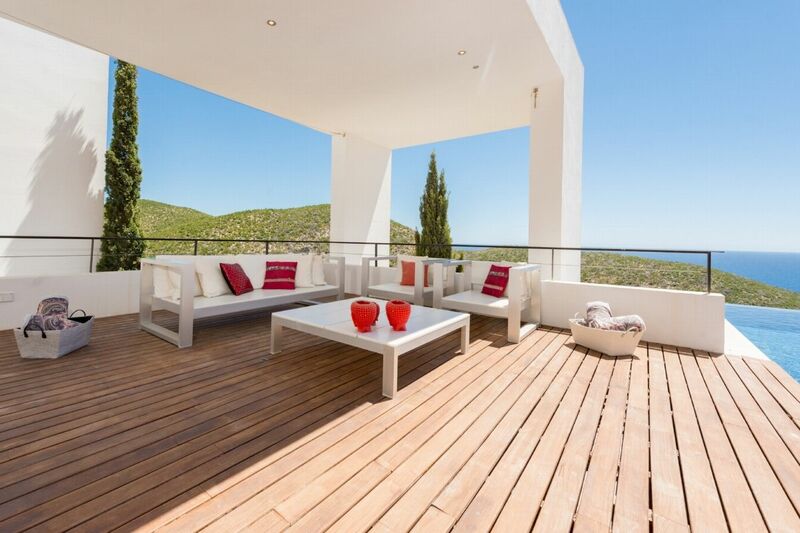 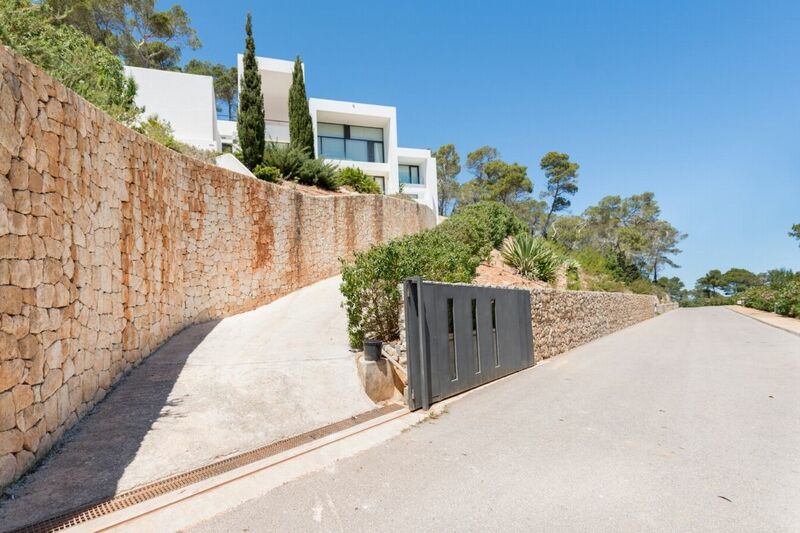 Minimalistic property offering impeccable sea and country views located in a gated community. 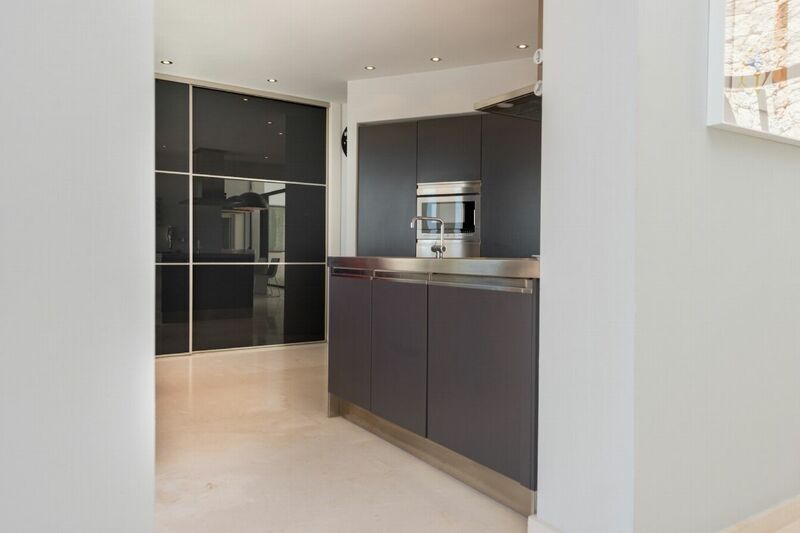 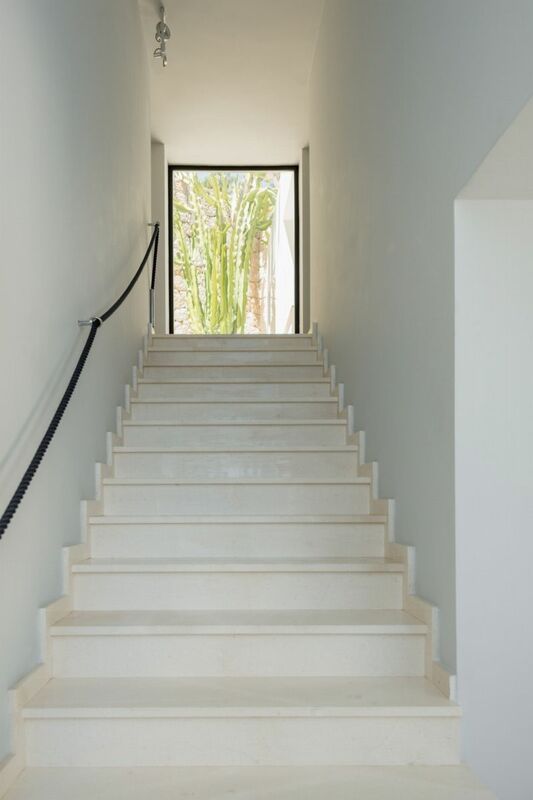 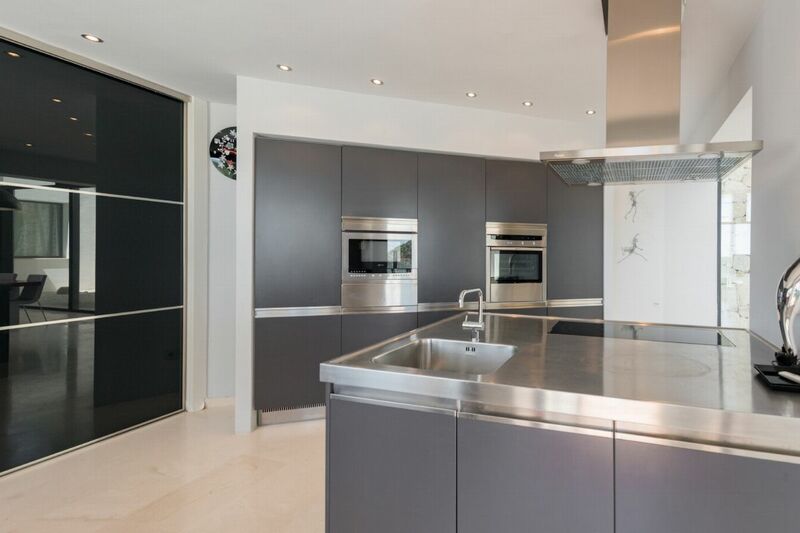 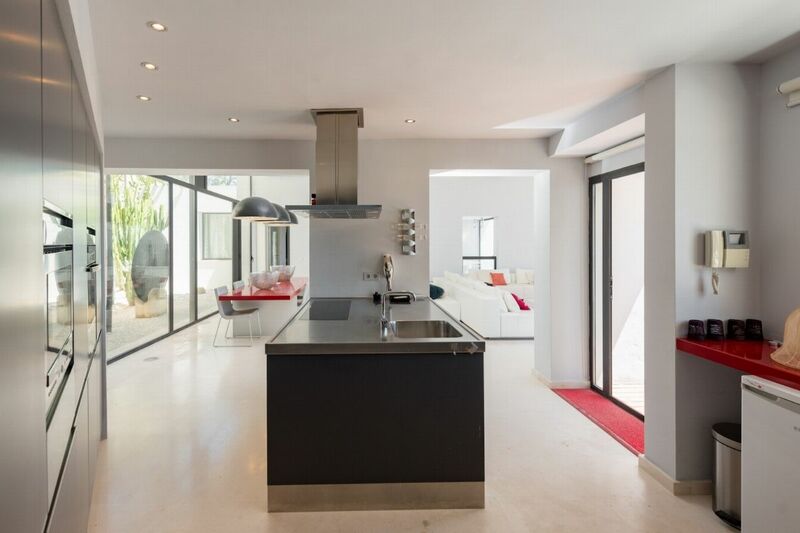 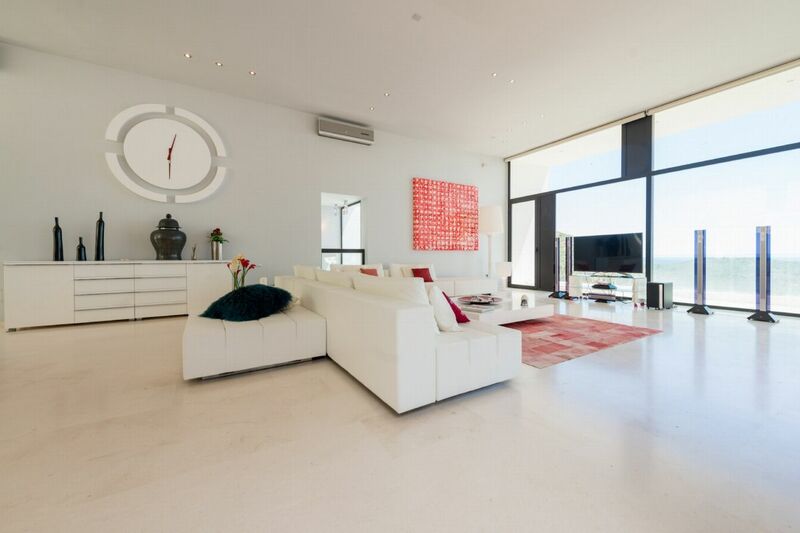 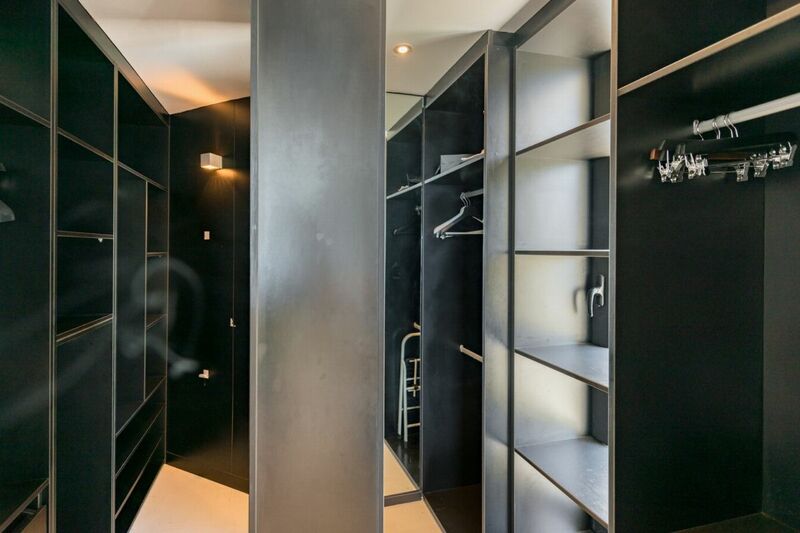 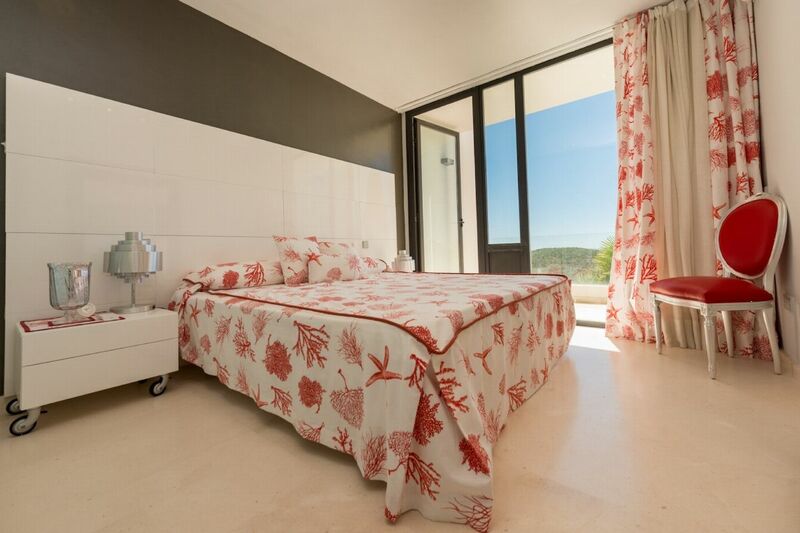 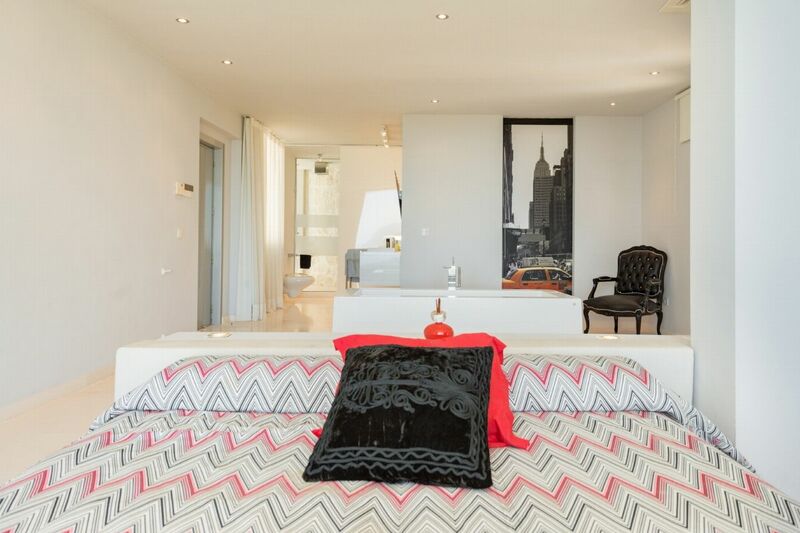 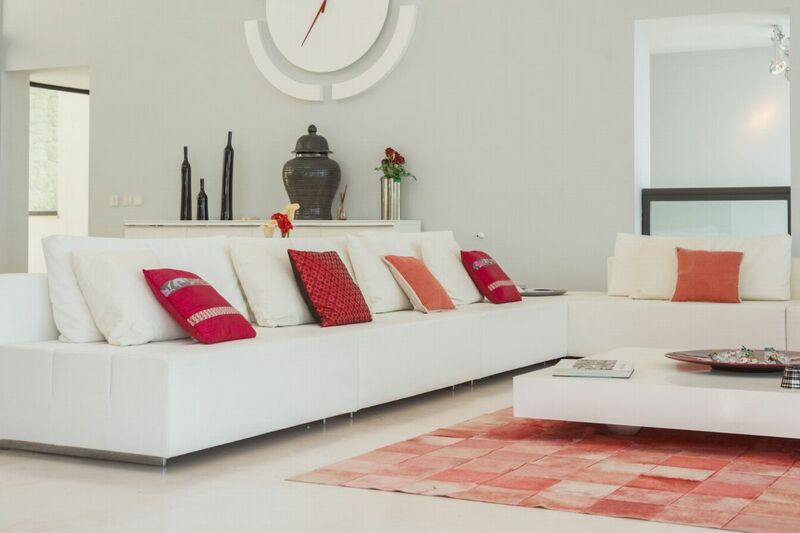 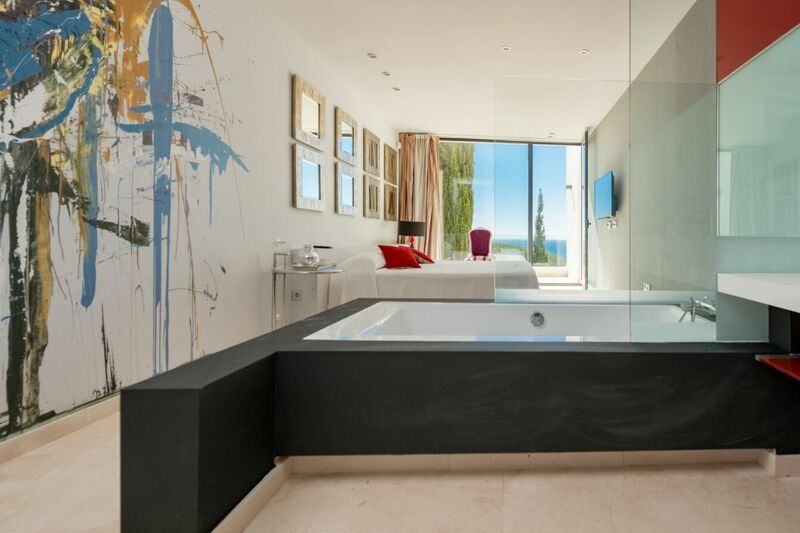 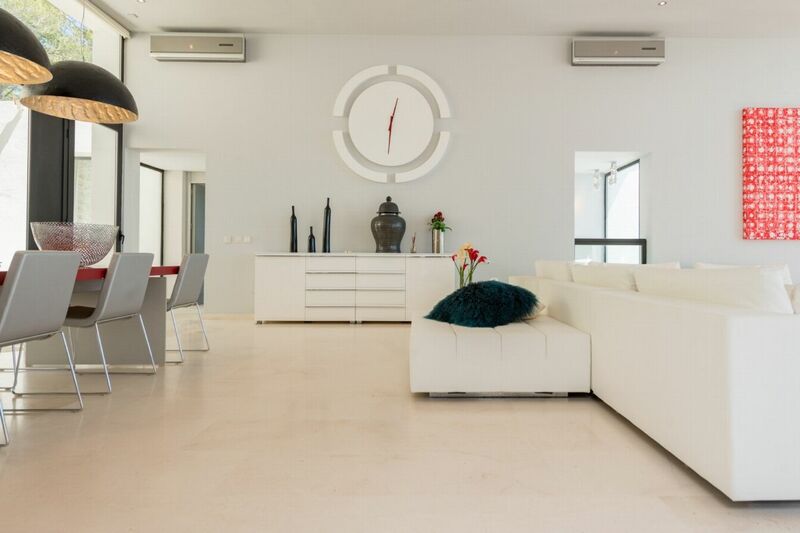 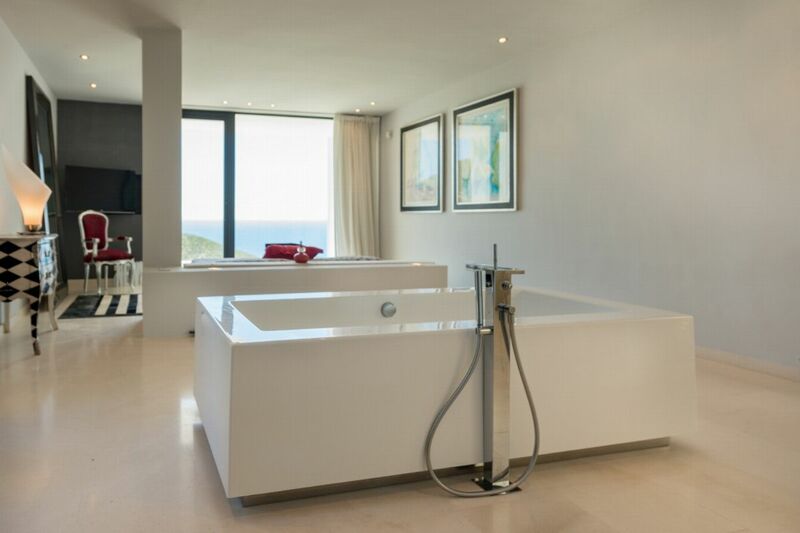 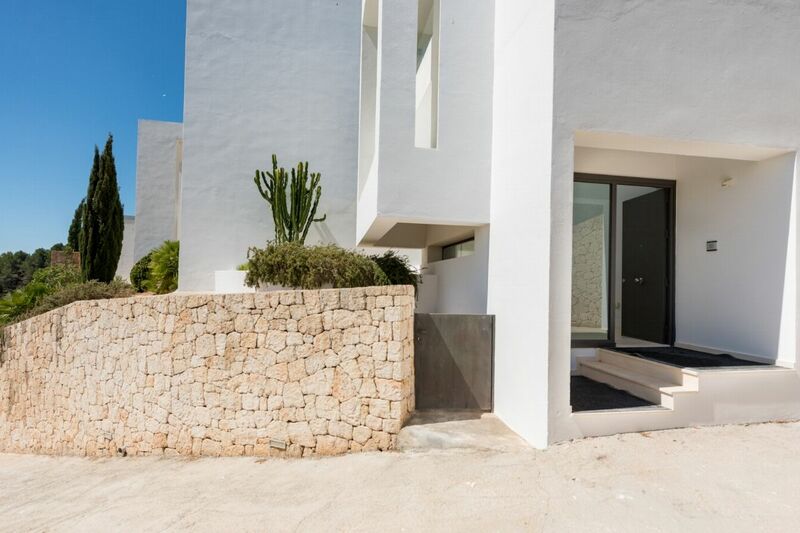 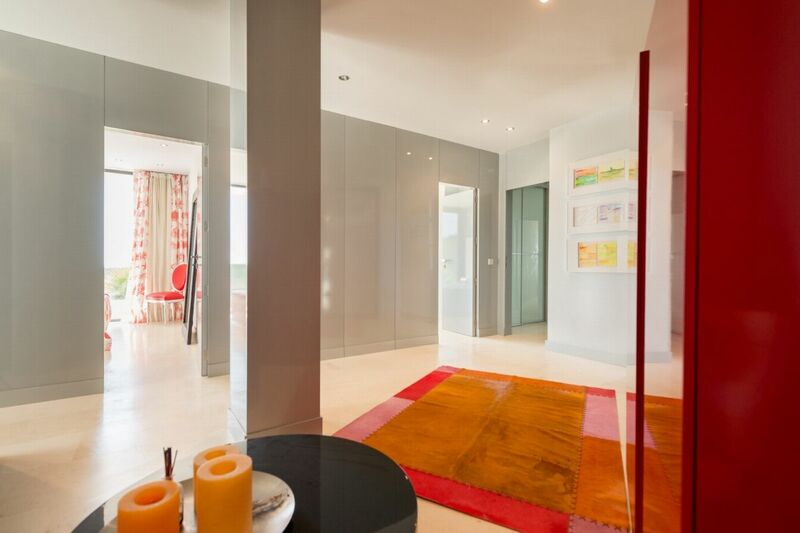 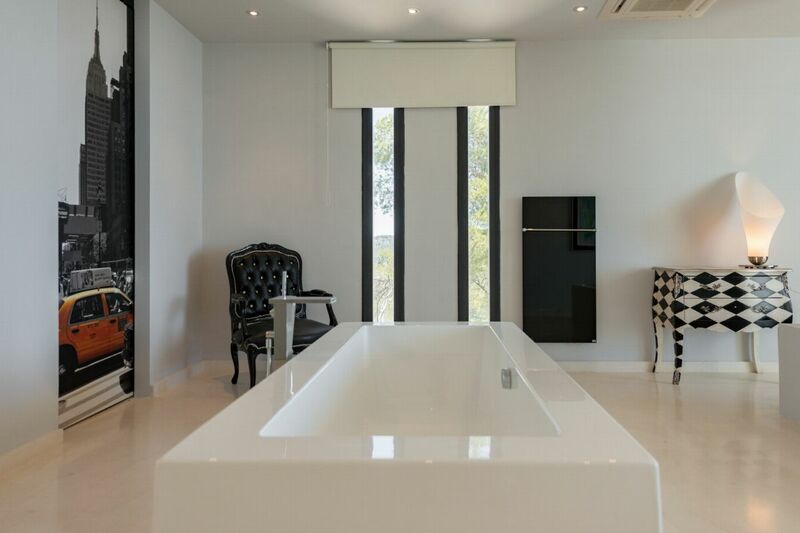 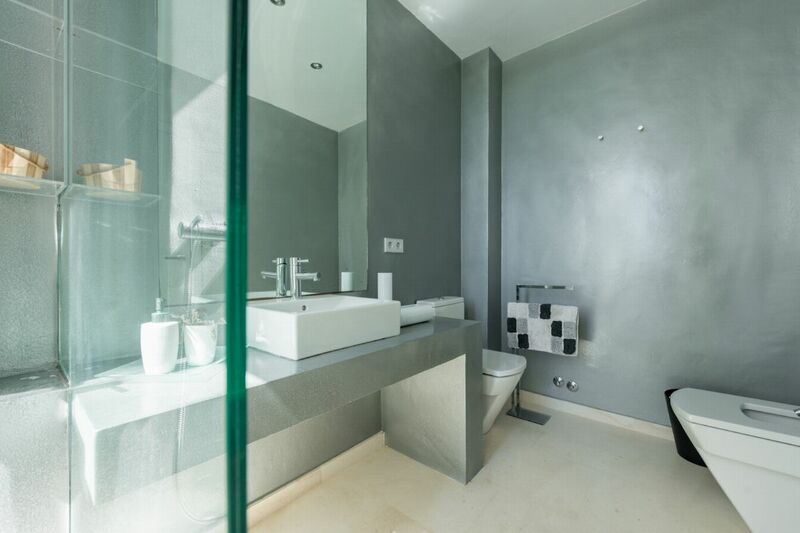 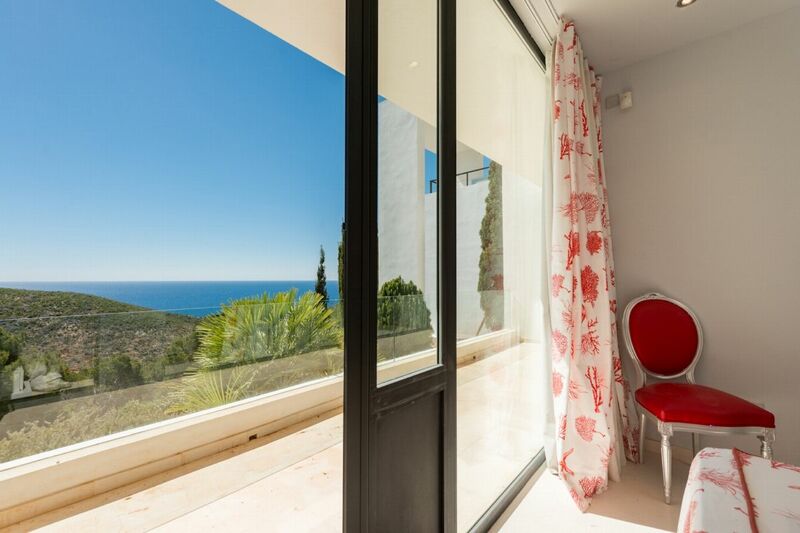 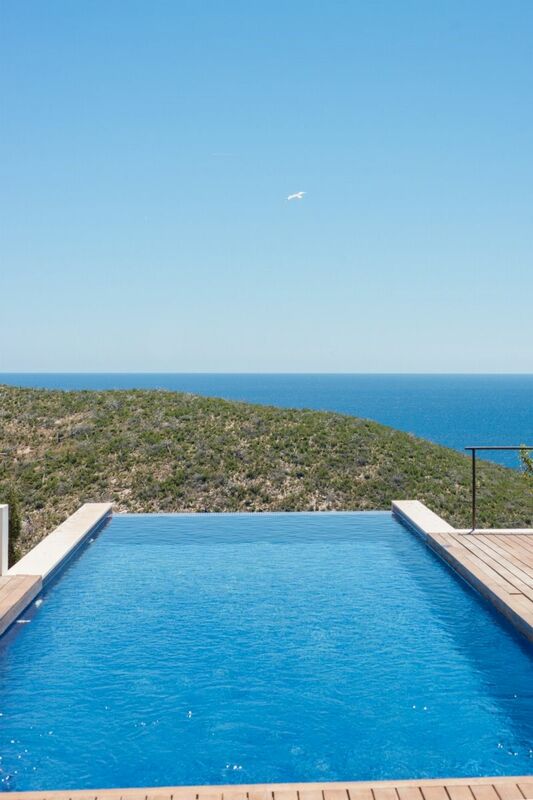 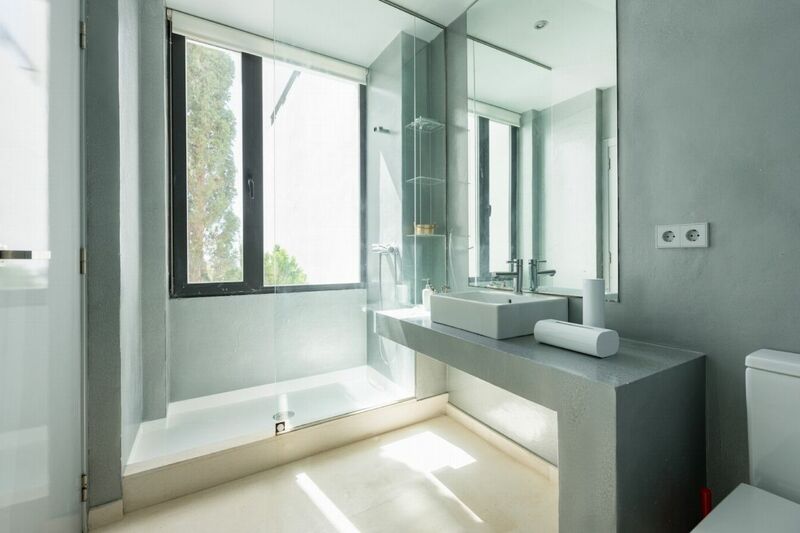 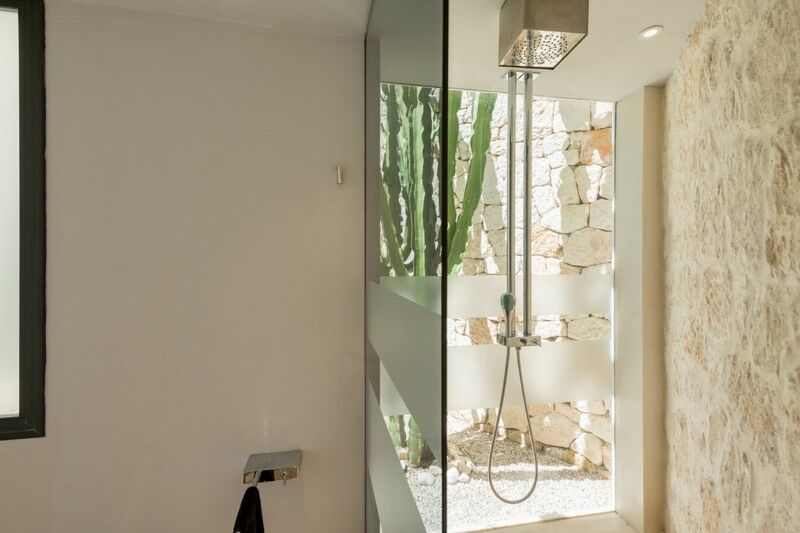 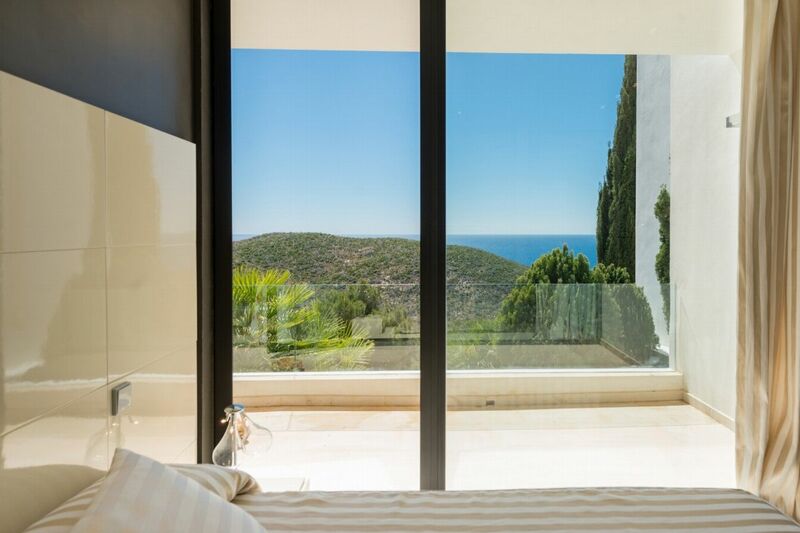 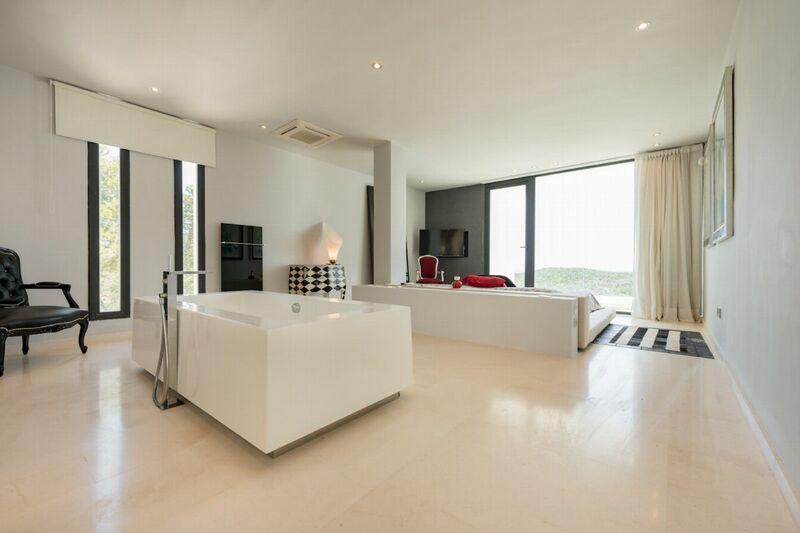 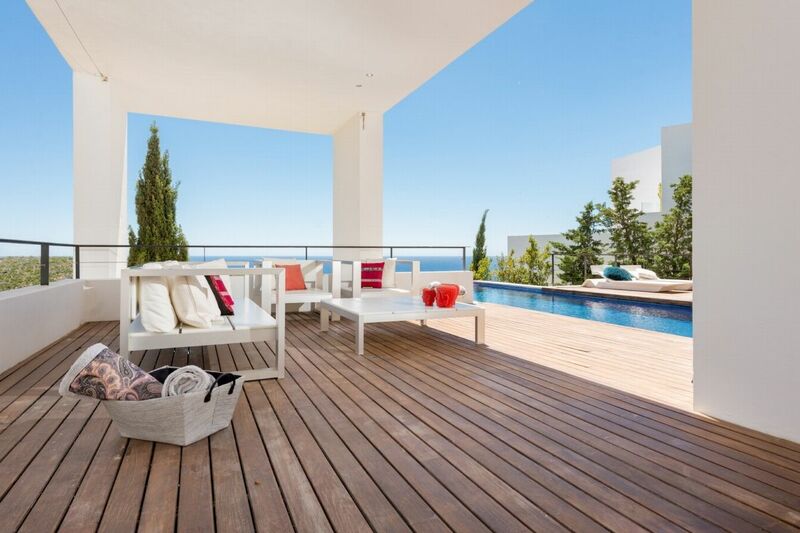 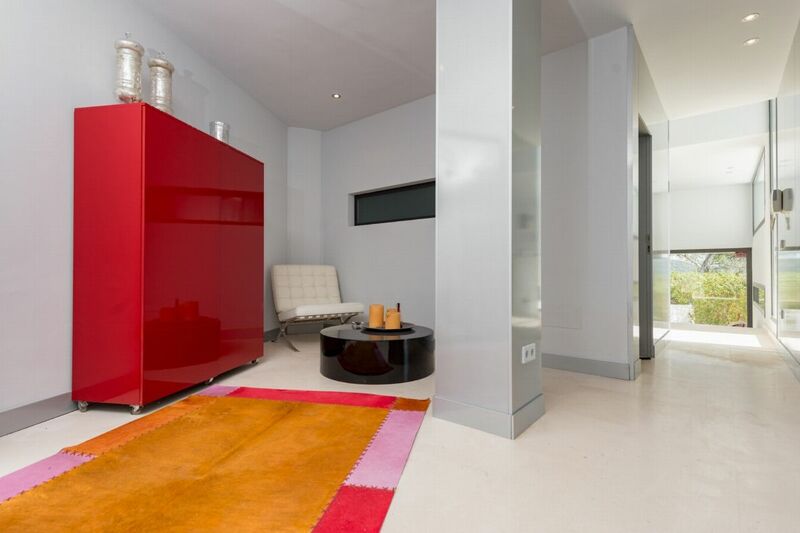 This is a superb modern and luxurious 5 bedroom property situated in the 24/7 guarded urbanisation of Roca Llisa half way between Ibiza town and Santa Eulalia del Rio, it offers impeccable sea and countryside views and is appointed to the east. 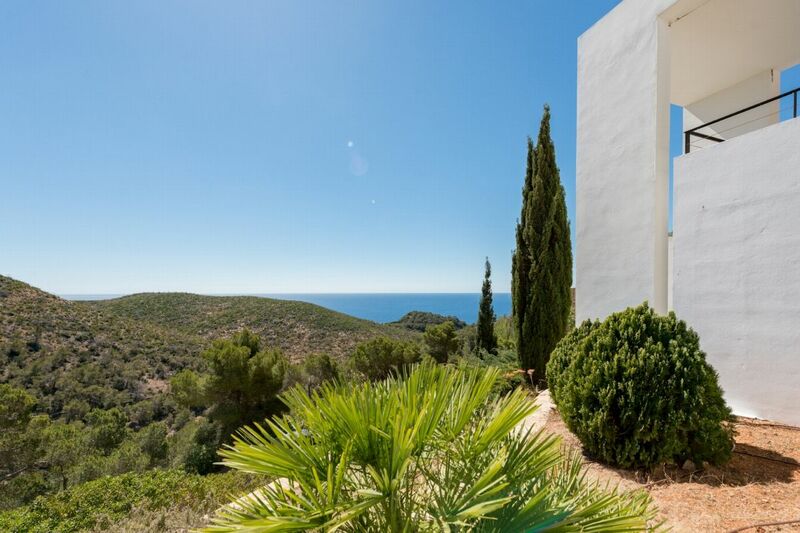 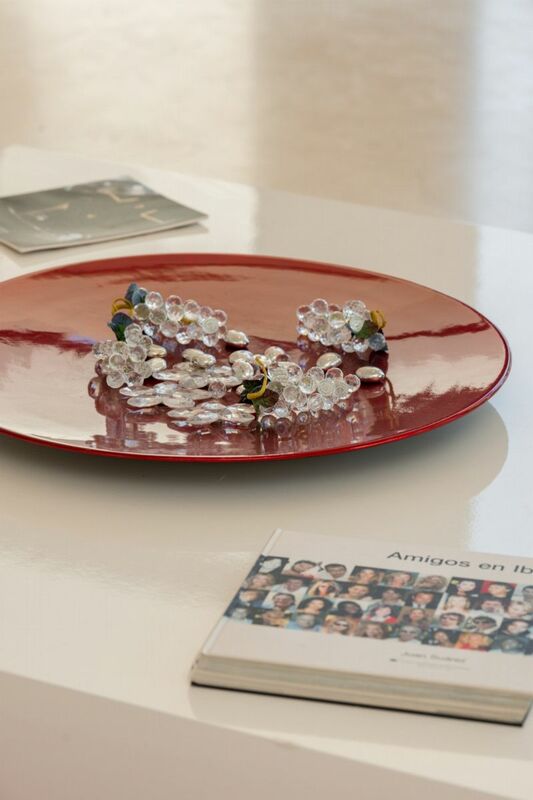 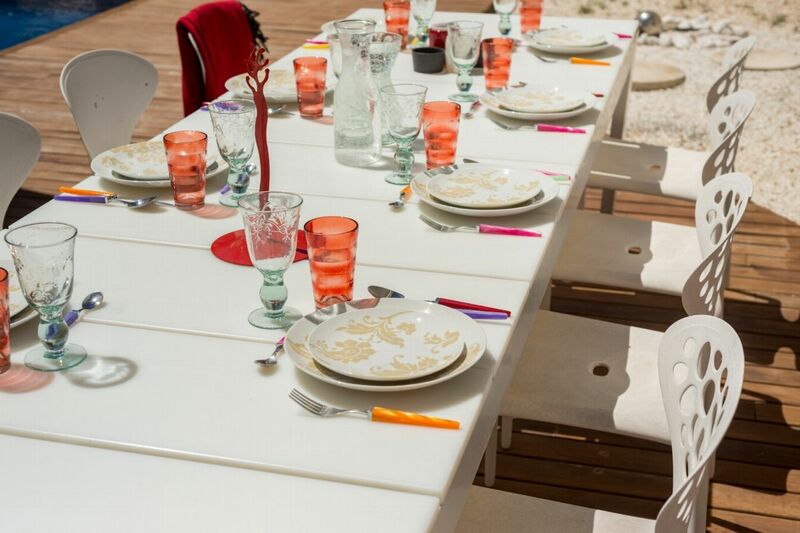 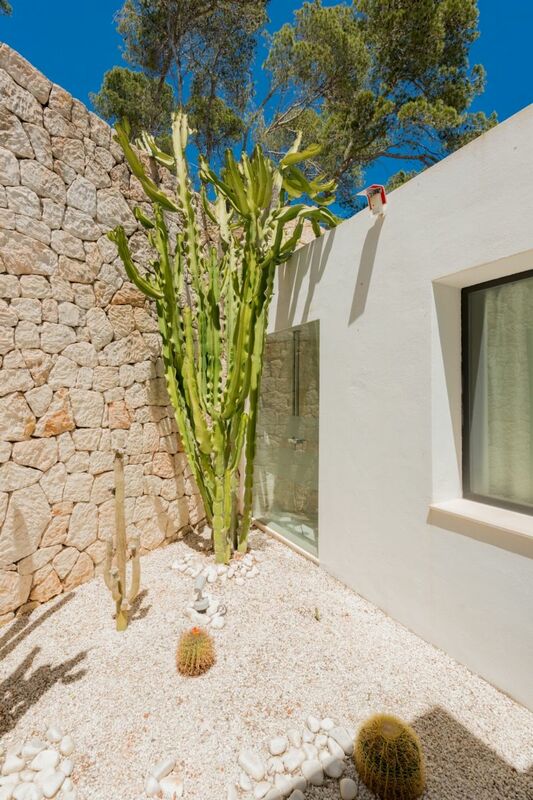 The villa is located perfectly on the island, just a short drive of 28 minutes from the airport, 10 minutes from Ibiza Town and 7 minutes from Talamanca Beach and Jesus. 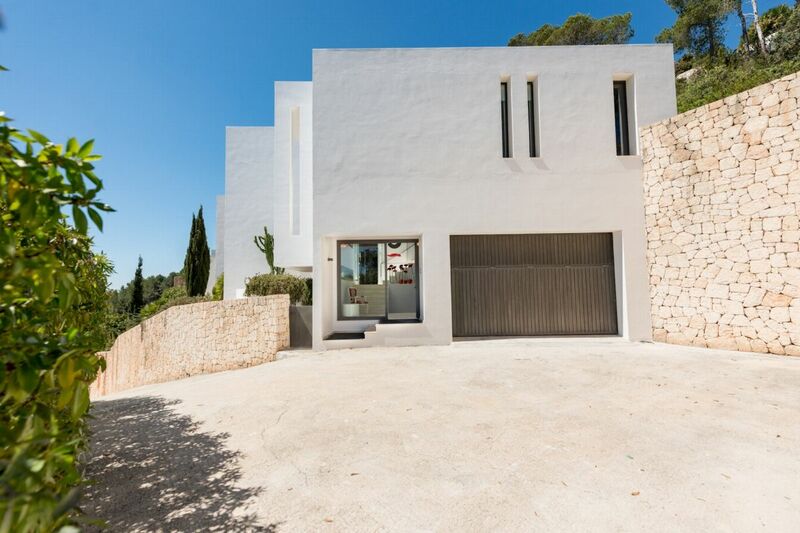 OUTDOOR AREAS The villa is situated on a hillside, it boasts a large garage and outside parking area with sufficient space for 3 cars. 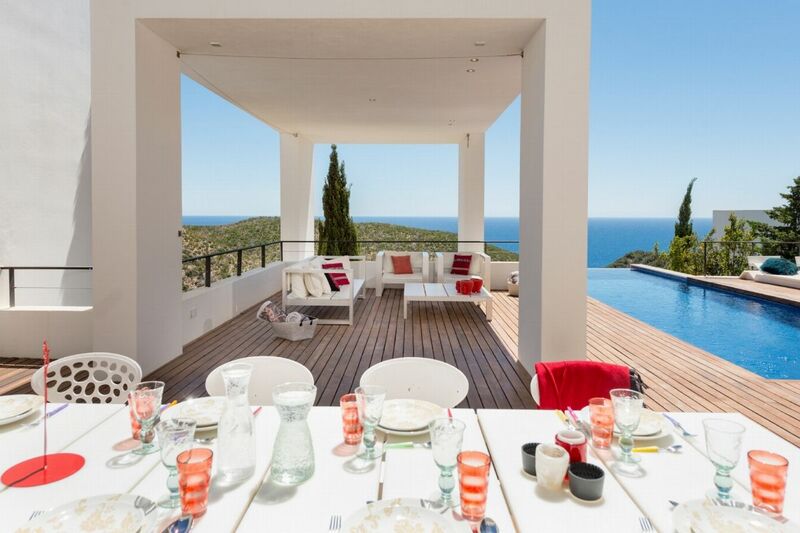 There are luxurious sun loungers surrounding the fantastic infinity pool, a covered chill-out area with comfortable seating beside the pool, a BBQ and a large dining table perfect for Al Fresco dining while the sun sets. 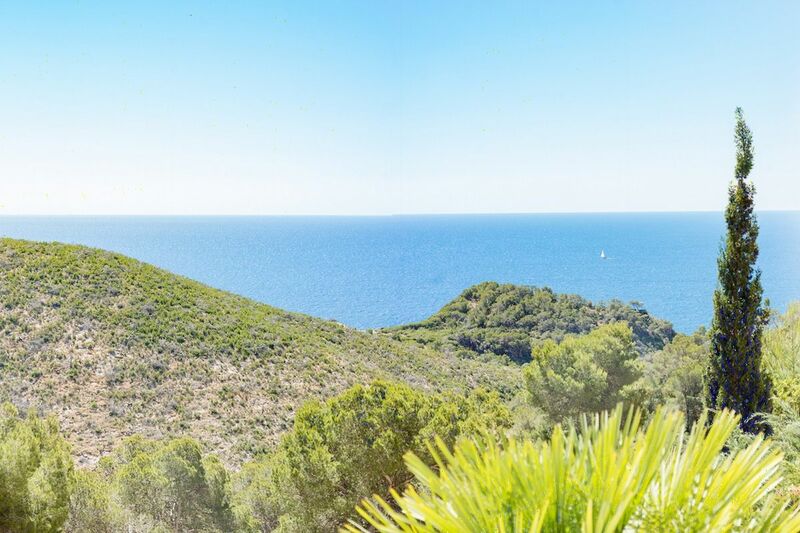 From the lounge area on the terrace, or from within the infinity pool the views of the sea and countryside are simply stunning . 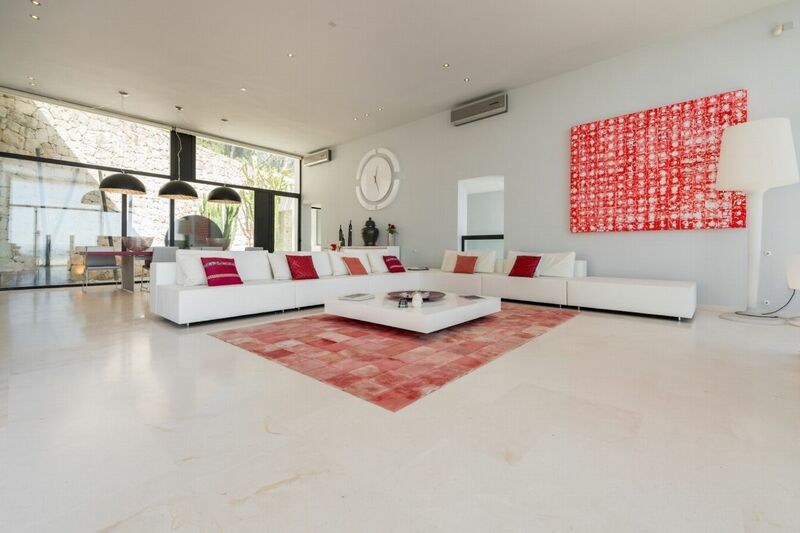 LIVING AREAS With its high ceilings and large windows, the house provides its guests with an open and spacious feeling, it is furnished and decorated in a comfortable modern style with a combination of red, black and white highlights. 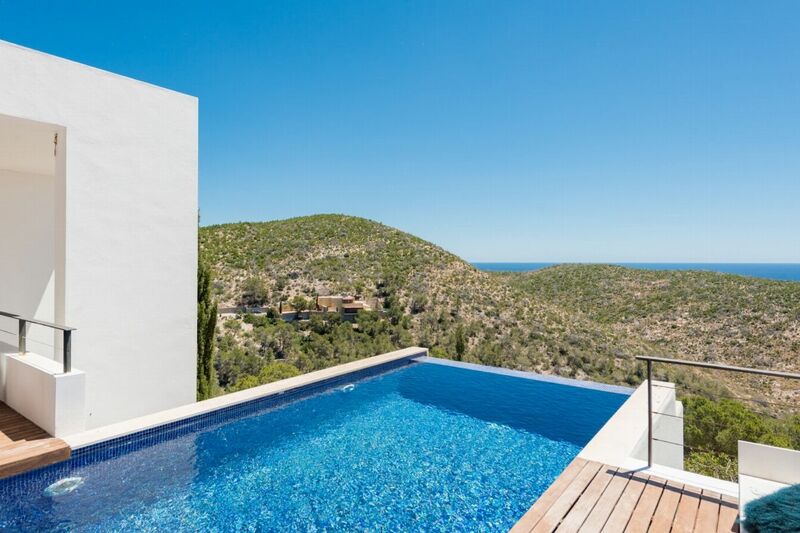 On the first floor the open plan lounge, dining area and fully equipped kitchen can be found, as well as the terrace and pool area, all offering an amazing view over the sea. 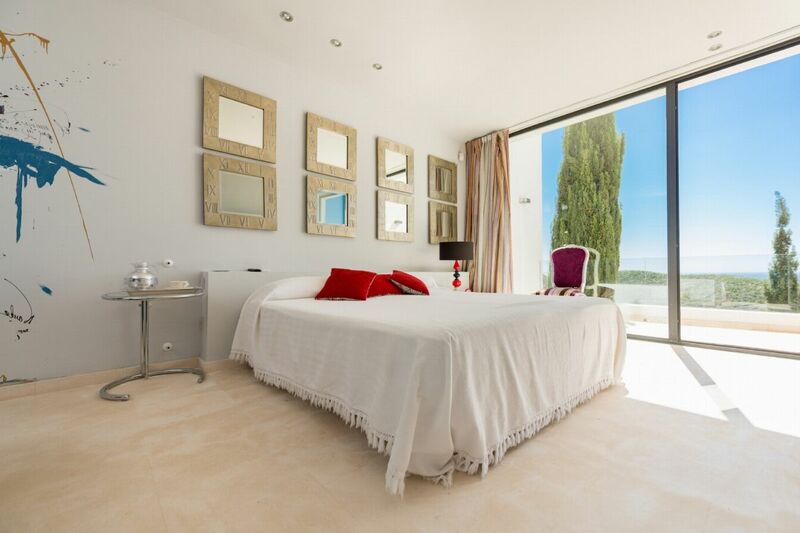 The property is fully air conditioned and has access to very good WiFi. 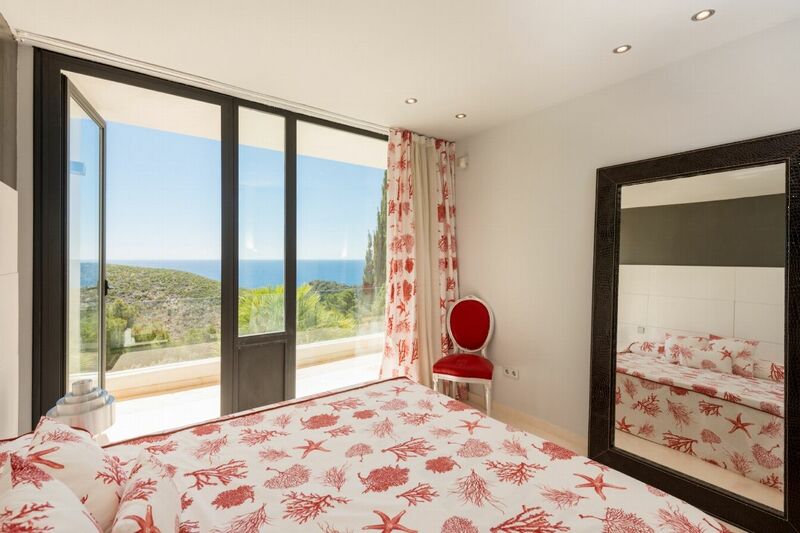 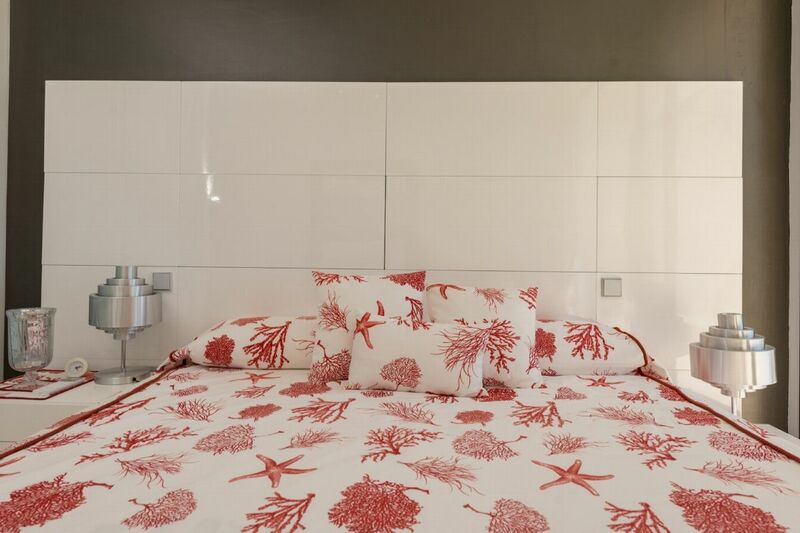 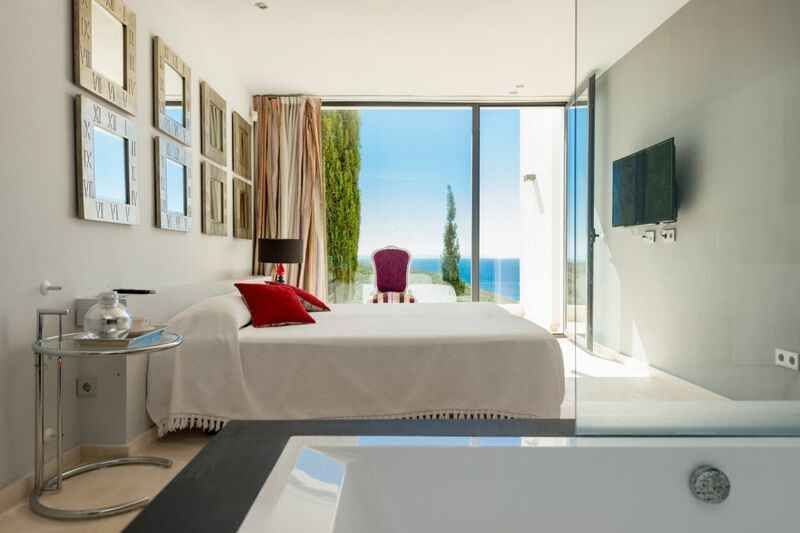 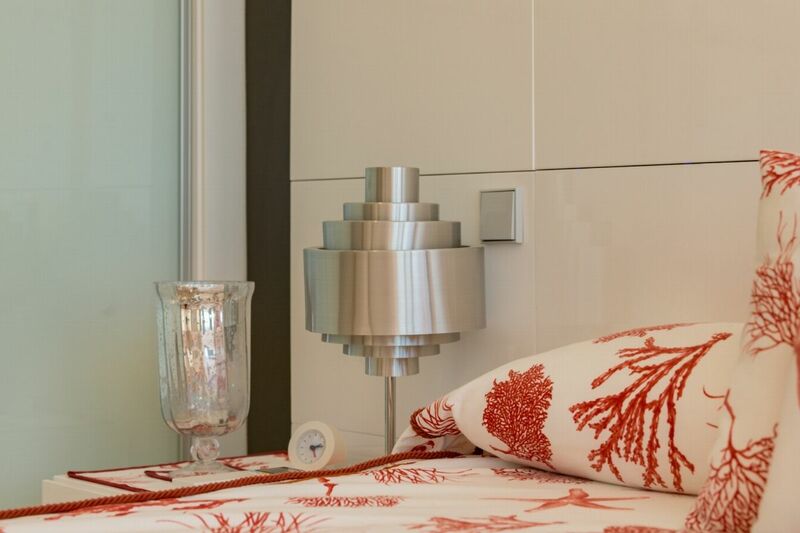 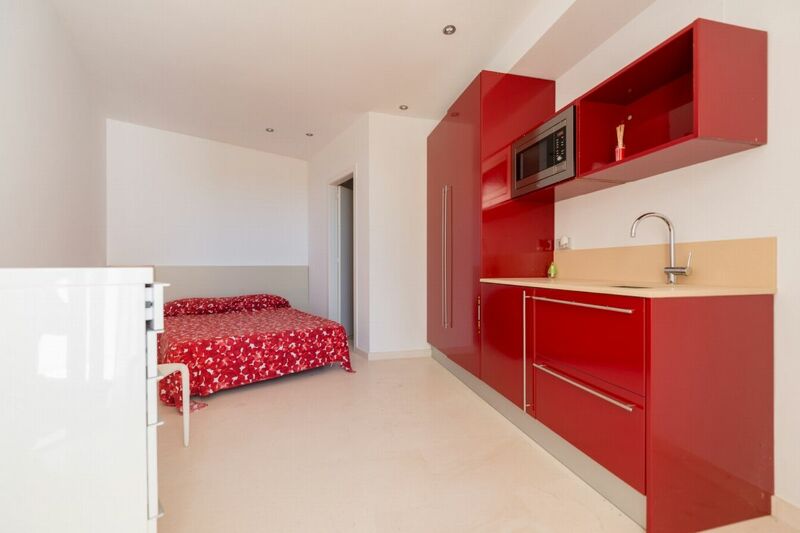 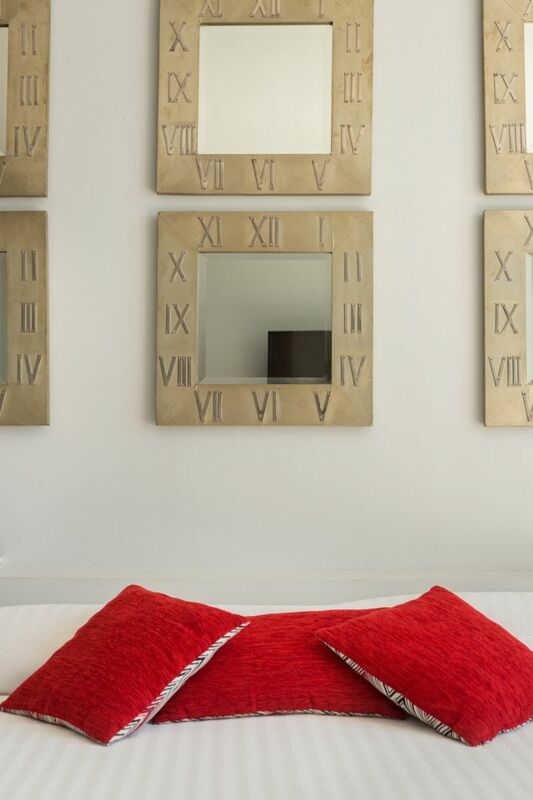 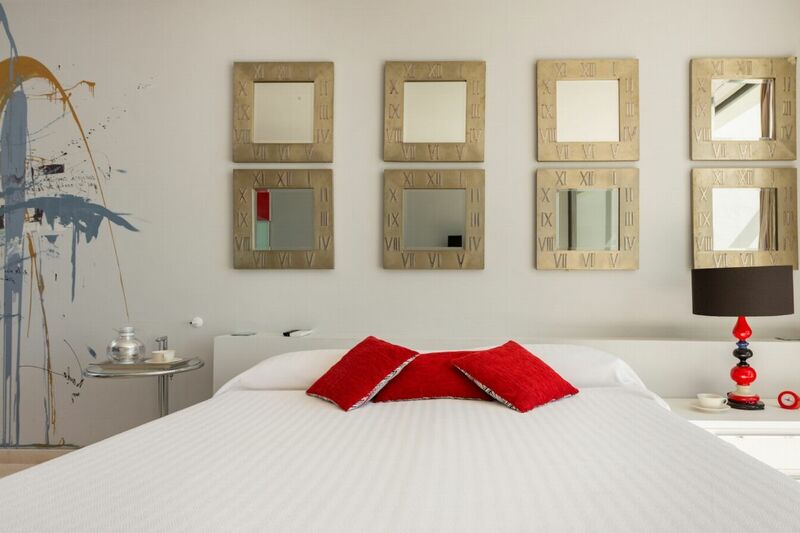 King size bed, wardrobe, air conditioning, terrace shared with Bedroom 3, sea and country views. 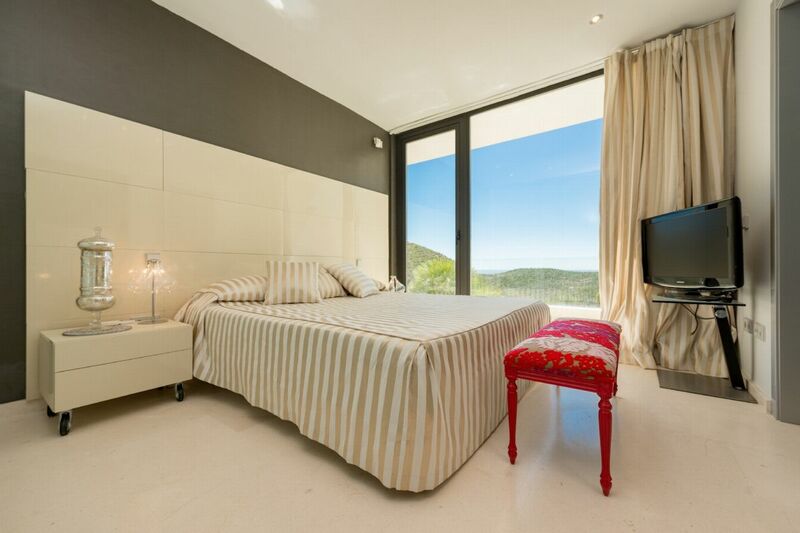 Bedroom 3: King size bed, TV, air conditioning, terrace shared with Bedroom 3. 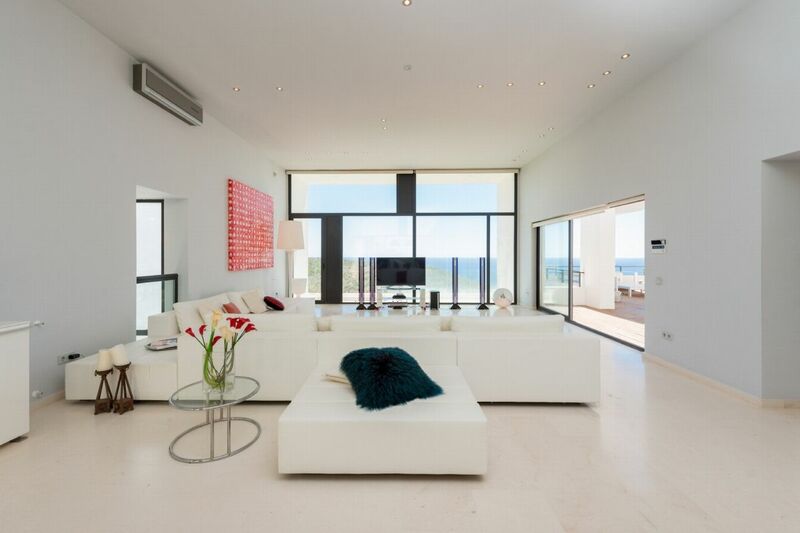 Sea and country views. 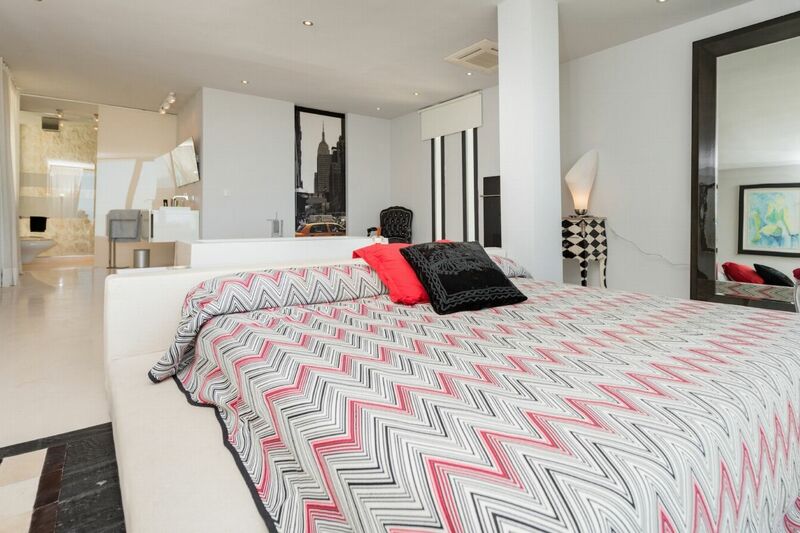 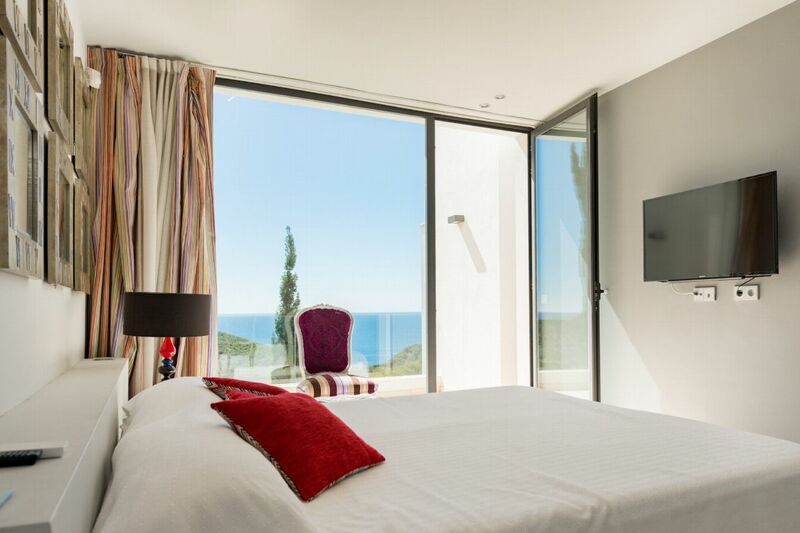 King size bed, TV, air conditioning, terrace shared with Bedroom 2, sea and country views.